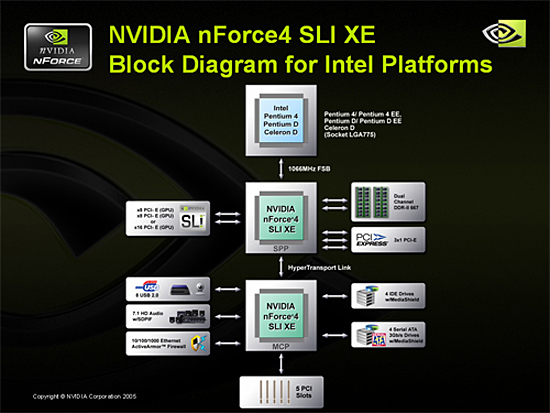 The nForce4 SLI XE MCP is a cost-reduced follow-up to the nForce4 SLI MCP . 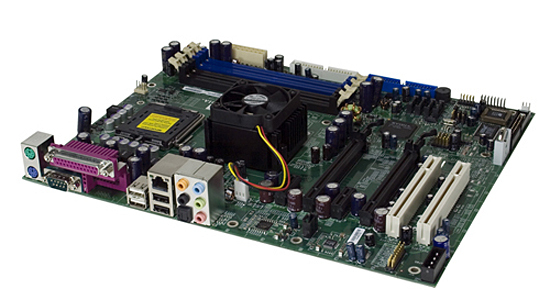 Unlike the nForce4 SLI MCP, this chipset will fully support the Presler, Cedarmill, and Smithfield series of processors and offers High Definition Audio. The price target that NVIDIA has set for motherboards based on the nForce4 SLI XE MCP will be in the $99 US range and will go upwards based upon additional features implemented on the boards. The reference design motherboard is shown above and represents the options that NVIDIA is targeting for the $99 US price point. The two SLI-Ready PCI Express x16 slots allow you to use two graphics cards (x8 PCI-E operation) or one SLI-Ready PCI Express graphics card and any storage, networking, or multimedia add-on cards (PCI Express x1, x4, x8 cards) for increased configuration flexibility and performance. We currently do not have boards in house to test and verify against NVIDIA’s performance claims, but we do expect samples to be received shortly.